The perfect side dish to chicken or fish, these tomatoes are a guaranteed crowd pleaser. Choose firm tomatoes for best results. Scoop out the center of each tomato half, removing the seeds and juice. Season the inside with tiny pinch of salt and little black pepper. 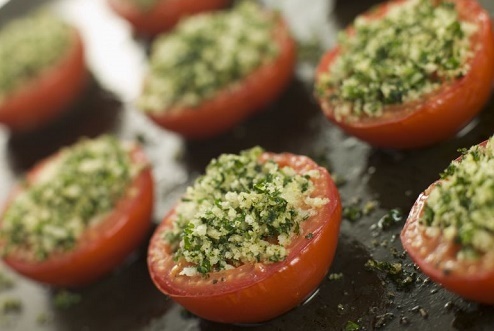 Fill the inside of each tomato half with 2 tablespoons of pesto. Place mozzarella and Parmesan cheeses over sauce, and top with a sprinkle of bread crumbs. Bake in a 350 oven approximately 6 minutes, or until cheese is bubbly and bread crumbs are browned.